The Hermitage of St. Honoratus (ermita de Sant Honorat / ermita de San Honorato) is a shrine of the island of Majorca located on the Puig de Randa. This is one of the three shrines of the Mount of Randa, less important, the size, the Cura sanctuary that sits on top of the Mount. 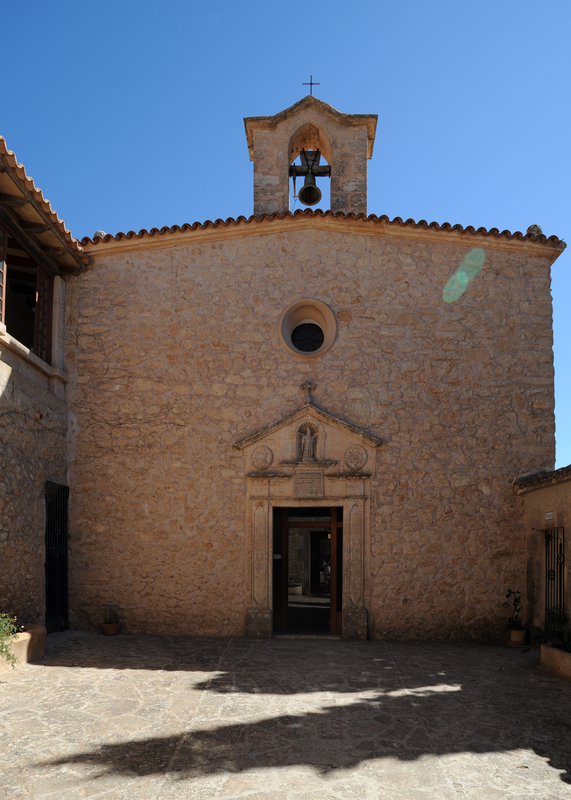 The ermita de Sant Honorat is located on the lower slopes of the southern slopes of the Puig de Randa, which dominates the center of the plain of Mallorca. 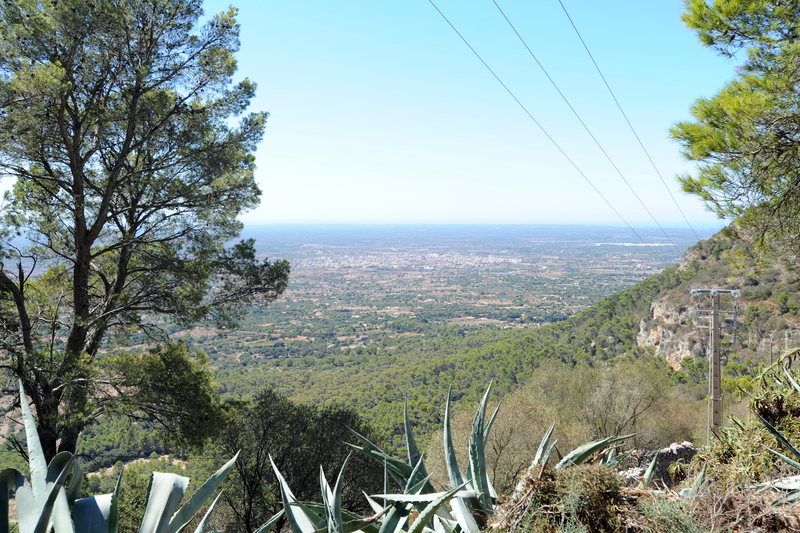 From the village of Randa, located at the foot of the Mount, a small serpentine road leads to the mountain of Randa (Carrer de Cura and road Ma-5018), after about 1.3 km you reach a small road that leads to the shrine de Gràcia, after another 1 km path that branches at an acute angle on the right side we find, this path leads to the terrace of the sanctuary of Sant Honorat. 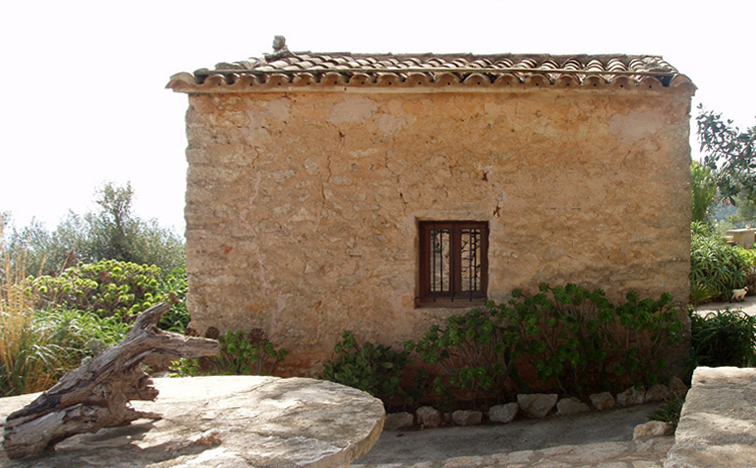 The Hermitage is located above a cliff overlooking the sanctuary of Gràcia. From the terrace, planted with oaks, and from the gardens of Sant Honorat, you can see the southern part of Mallorca, the plains of Llucmajor and Campos, and to the island of Cabrera southeast. Sant Honorat is the municipality of Algaida of which St. Honoratus is the patron saint ; sant Honorat is celebrated on January 16 by bonfires and traditional Majorcan dances "Cossiers". The ermita de Sant Honorat was founded in the late fourteenth century, a knight of the native town of Inca origin Selva near Inca Arnau Desbrull, accompanied by Mateu Catlar. After living for 30 years as hermits on Mount Randa, they asked, in 1394, the Bishop of Mallorca, Lluis de Prades, permission to build a chapel dedicated to St. Honoratus (sant Honorat). 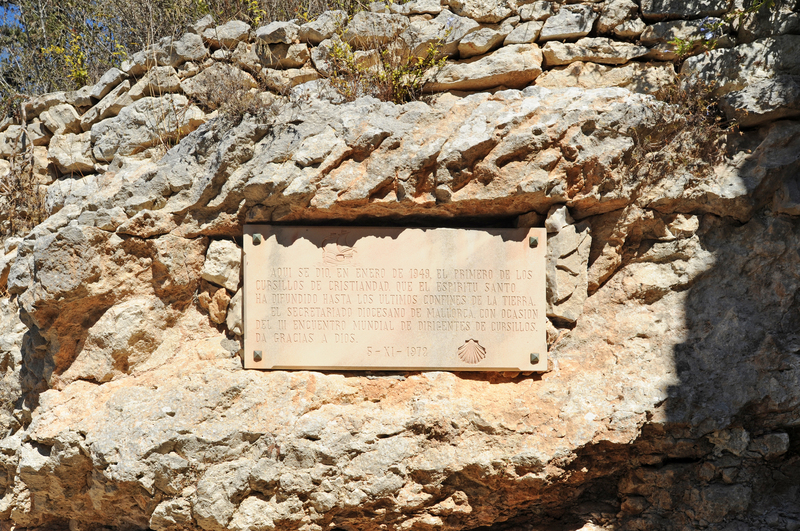 Arnau Desbrull chooses the part of the south-facing, sheltered from the winds of the Mistral and Tramontane mountain to build the chapel was consecrated January 16, 1397, as indicated by a plate placed on the site of the chapel current. Due to the dilapidated state of the original chapel, a new chapel was built from 1654 to 1661, "by workers, jurors and the rector of Algaida". 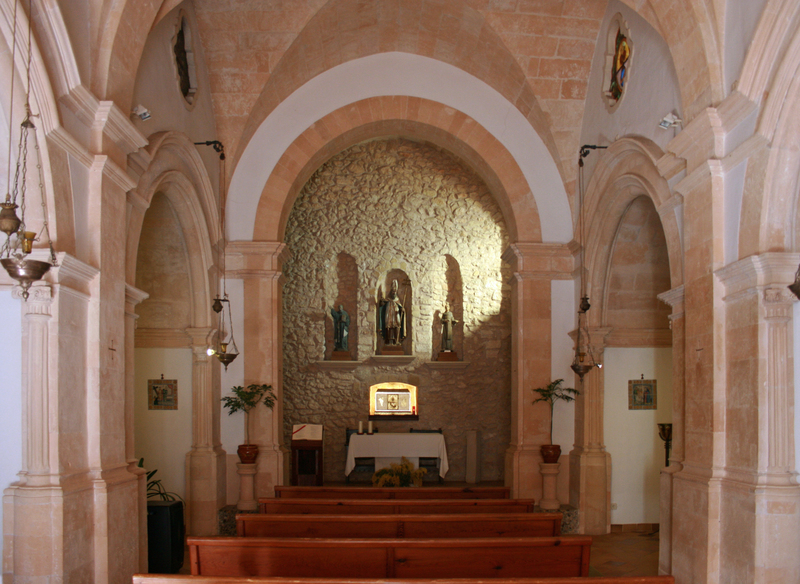 During the seventeenth and eighteenth centuries the chapel remained under the administration and protection of jurors and rectors of the city of Algaida. 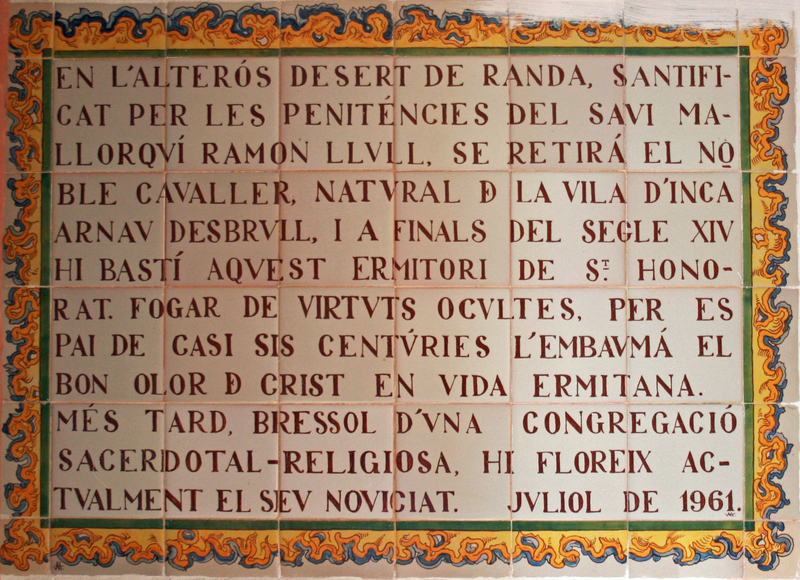 In 1763, the Diocesan Congregation of Hermits of St. Paul and St. Anthony, founded by the Venerable Joan Mir de la Concepción, made ​​an agreement with the council Algaida to settle in the hermitage of Sant Honorat and it remained there until the late nineteenth century. 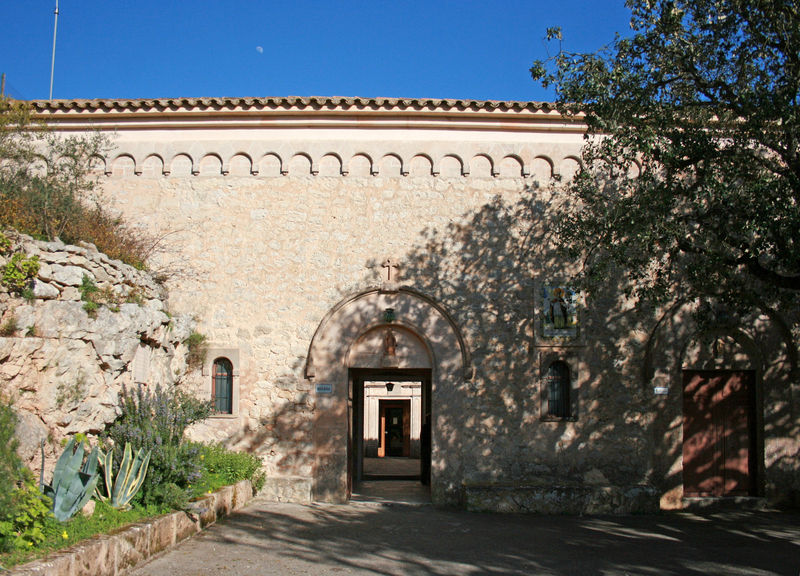 In 1805 members of the Congregation of the hermitage of Sant Honorat left to found the hermitage of Betlem in Colónia de Sant Pere. 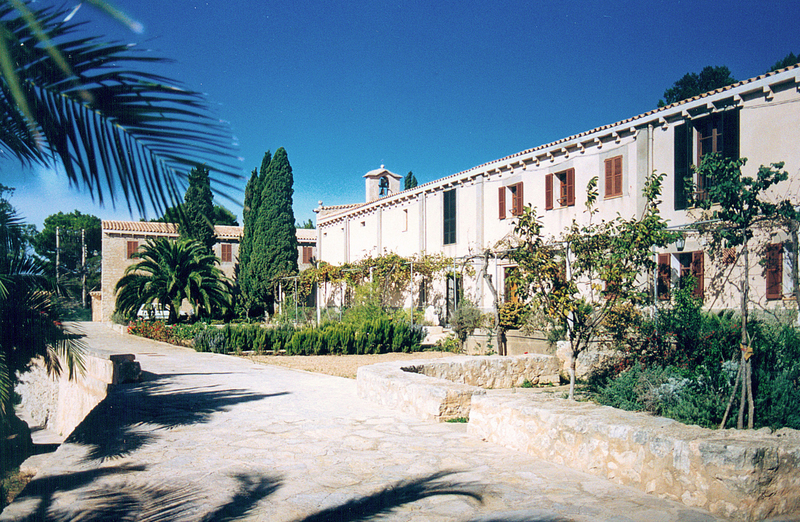 From 1860-1861 the future Blessed Francesc Palau i Quer retired to the hermitage of Sant Honorat and reorganized. 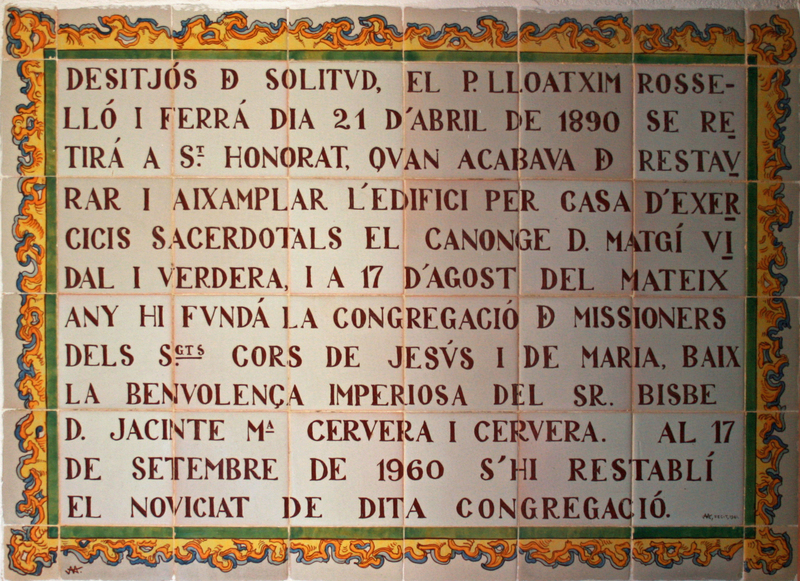 In 1890, the chapel was led by Father Joachim Rosselló i Ferrà where he founded the Congregation of the Missionaries of the Sacred Hearts of Jesus and Mary (Missioners dels Sagrats Cors / Missionaries de los Sagrados Corazones). The building was restored in 1962. 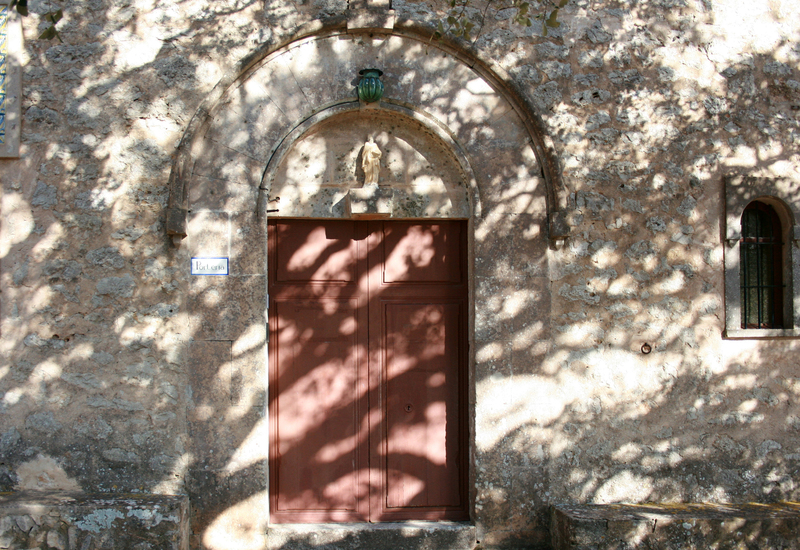 The Hermitage of St. Honoratus features a small chapel and a few monastic buildings. A large courtyard planted with oaks leads to the main facade, built in 1888, which revolves around two gates semicircular arches surmounted by a small cross, with an effigy of Ramon Llull in the eardrum. 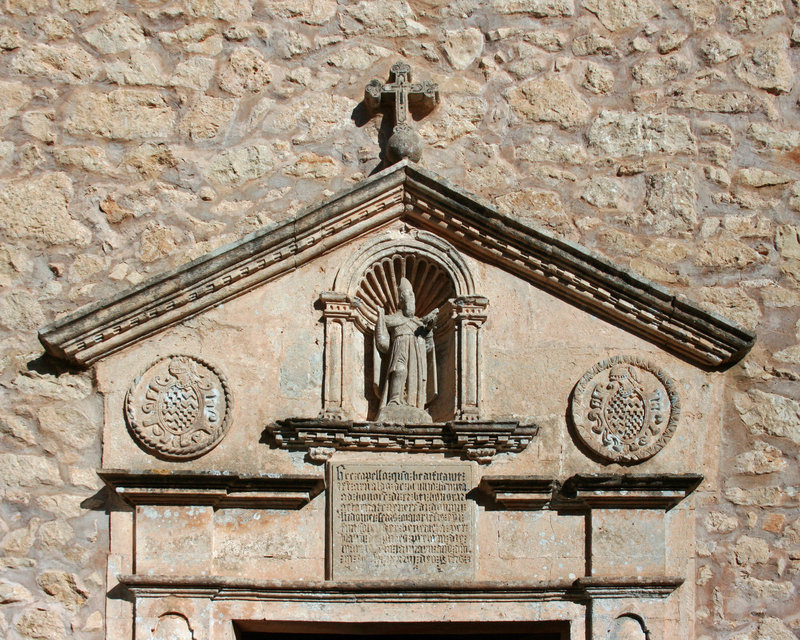 The portal opens right on the porter’s lodge of the sanctuary (porteria) and the left of the courtyard of the church. Between the two gates is a ceramic, dated 1976, which is the patron saint of the sanctuary, St. Honoratus. The chapel we see today dates from 1661 and has replaced a chapel of the fourteenth century, the original chapel there is a stone plaque, which is above the entrance gate, which is engraved in Gothic characters and commemorating the consecration of the first chapel in 1397. 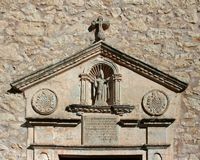 The front of the chapel has a portal topped with an effigy of St. Honoratus, placed in a niche flanked by two noble crests representing the arms of families Tagamanent and Amar. The church is rectangular with three chapels on each side. The nave is covered by a barrel vault. Among the images that are worshiped in the side chapels and baroque Virgin crucifix Holy Christ of the Hermits (Sant Crist dels Ermitans), probably of the fourteenth century, the first mention dates from 1450 and was made ​​by Arnau Desbrull one notices. The niches behind the altar contain sculptures of Ramon Llull, St. Honoratus and Francesc Palau. The garden includes the Chapel of Blessed Francesc Palau and the cemetery is located in the eastern part of the garden. Besides the chapel, the chapel of Sant Honorat is not open to non-registered visitors. The hermitage run by the order of the Missionaries of the Sacred Hearts, receives seminar groups, there are two conference rooms and a room for about 22 participants.